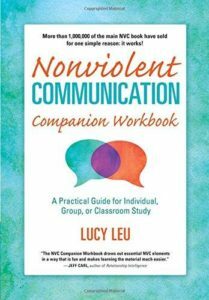 [by Lucy Ley | Puddledancer Press 2003] Learning Nonviolent Communication (NVC) has often been equated with learning a whole new language. The NVC Companion Workbook helps you put these powerful, effective skills into practice with chapter-by-chapter study of Rosenberg’s cornerstone text, NVC: A Language of Life. Create a safe, supportive group learning or practice environment that nurtures the needs of each participant. Find a wealth of activities, exercises and facilitator suggestions to refine and practice this powerful communication process. Whether you’re learning on your own, in a group or in a classroom, this workbook will serve as an exceptional resource. – Individuals: Includes useful activities and ideas for employing the liberating principles of NVC every day. – Group Practice: Find guidance for getting started, group process, and activities. – Teachers: Provides the basis for developing your own courses, or augmenting an existing curriculum.